So having posted a list of desirable characteristics for NRC commissioners and chairs, the next step would be to ask Dr. MacFarlane how she measures up to these characteristics. One of the key things to interview questions is to ask about PAST behaviors, not hypothetical performance. This is called behavior based interviewing and provides a better indication of how someone will actually perform on the job. So, Dr. MacFarlane, welcome to my interview. Ms. MacFarlane, your training is in geology, but much of your career has been spent considering the disposal of used nuclear fuel. Could you tell us how you developed your expertise in this area? Where did you seek out information? What experts did you learn from and why did you choose them? Specifically, you wrote co-authored a paper with Dr. Von Hippel and Mr. Alvarez regarding dry cask storage (Accession Number ML120960695) that the NRC specifically refuted (Accession Number ML052340740). Did this exchange of views in any way modify your views? If so, can you describe this reconsideration? 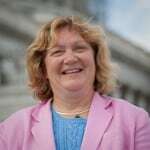 Post by Hugh Gusterson (Dr. MacFarlane’s husband) http://www.thebulletin.org/web-edition/columnists/hugh-gusterson/the-lessons-of-fukushima He considers Ed Markey to be “the middle ground” on nuclear. As far as I’m aware no other commissioners’ spouse in the history of the commission has been active either for or against the nuclear industry. Dr. Gusterson appears to have strong opinions that are not in alignment with the current commission. It is critically important that the chair maintain not even the appearance of bias. How will this be accomplished here? Your work in Senator Reid’s office creates a clear conflict of interest regarding Yucca Mountain. In addition, your published works indicating that you’ve made a decision related to the facility despite the fact that the final submittal had not yet been made to the NRC. Similar to Dr Apostalakis’ recusal, will you also recuse yourself from any votes that may come before the commission in regards to Yucca Mountain? Your primary expertise appears to be geology. Could you explain when questions of geology have come before the commission for deliberation? What specific expertise do you possess that routinely comes before the commission for deliberation? How did you develop that expertise? Please provide specific evidence – peer reviewed papers, etc. As Chair, you will be responsible for a broad range of issues, and guiding the commission through a number of critical areas, like the response to Fukushima, completing reviews of a number of proposed designs and combined operating licenses, and other new fuel cycle facilities. What is your expertise related to operating nuclear power plants? Can you describe how the commissions review activities are managed or which areas of the Code of Federal Regulation are relevant? Can you please provide a list of all of your areas of expertise as related to the Nuclear Regulatory Commission? Dr. Jaczko’s lack of such expertise led to a number of statements and incidents that required retractions by the NRC. In specific, Dr. Jaczko made recommendations for evacuation in Japan that were contrary to the Japanese government. These statements caused significant confusion and harmed the relationship between our governments. In the event of an emergency, the chairwoman of the NRC will be responsible for the NRC’s response. Can you explain how the NRC, the EPA, FEMA, local officials, and the licensee (utility) are to interact to ensure the safety of the public? As a commissioner, you will have a small staff to manage, but as chair you will be the leader of a 4000 person agency. Dr. Jaczko had some serious management issues that we do not need to repeat. We’d like to know that you’ve managed something larger than your desk before taking the reins of this agency. What experience have you had managing multi-layered organizations? Can you take a moment to tell us about a crisis that you managed a team through. What went well and what didn’t? What did you do to assure team cohesion and functionality? Despite a number of years in academia, you have never achieved tenure. Why? This questions goes to an ability to follow-through on activities that are less interesting and to work within the framework of an organization. Such skills are critical in administrators. The NRC is an unusual structure for a federal agency. No individual is given ultimate power within the commission, rather five commissioners are expected to work as a team developing consensus and driving toward a science based regulatory policy and enforcement regime. Given recent past history on the commission, both commissioners and the chair must be consummate team players, always seeking to advance the agenda of the team. Individuals seeking personal gain, recognition, or personal agendas should be viewed with great concern. A number of colleagues have attested to your interpersonal style and willingness to work with others. Certainly, those skills speak well of your ability to work well within a team. However, the chairwoman of the NRC, you are “the first among equals.” When we look at highly effective chairmen and women of the NRC, we find leaders who work toward consensus, finding ways to develop common cause and common consent among the rest of the commissioners. Have you ever worked in such an environment? Can you describe having functioned as a leader in a peer group? What was the result of this group? Dr. MacFarlane, we’ve heard that you are a nice woman and a dedicated scientist. What we need is an ethical and knowledgeable leader for the NRC. Capable of guiding the commission through complex issues with clarity and technical astuteness. Show us these traits and we’ll support you all the way. Otherwise, please step aside and allow someone more capable lead the NRC. There have been a significant number of questions raised about Allison Macfarlane’s nomination to the NRC commission with the stated intent to make her chair of the same as soon as she is sworn in as a commissioner. Lots of comments both for and against her nomination have clouded the issues. I propose that perhaps a better approach is to create a clear set of criteria for both serving on the commission and serving as chair. Because the chair of the NRC must act as the top administrator for an organization with 4000 employees and has considerable decision making power in emergencies, the degree of expertise needs to be significantly higher as chair. Some of those skills can be learned while serving as a commissioner, but should not be developed “on the job” as chair of the NRC. I tend to prefer criteria that are verifiable by observable behavior. This allows clear questions that require the candidate to demonstrate her qualifications with past actions. Ethical behavior is a basic requirement for both commissioners and the chair of the NRC. There are several aspects of Ethics in this context are a requirement to be committed to technical and science based regulatory oversight. A committed scientist would be able to discuss when sound data changed a position, especially in areas beyond normal expertise. A strong regulator also must set aside political beliefs and evaluate issues brought before the commission without regard to political motivation. If even the appearance of political motivation exists, the individual must recuse herself from any decisions related to such motivations. The NRC is not about policy, only about safety of nuclear facilities. Personal opinion cannot unduly influence decision-making within the commission. Subject Matter Expertise can include technical, legal, or regulatory expertise when considering the NRC. No one can reasonably be expected to be an expert across the many areas of responsibility within the NRC. However, it is reasonable that all commissioners have expertise in one or areas that routinely come before the commission. It should be expected that the commissioner’s primary area of expertise would be one that at least occasionally comes before the commission. Learning beyond traditional degree programs is certainly an acceptable way to gain knowledge in additional areas. Such knowledge might even be gained during time as a commissioner. Because the chair has significant influence during emergencies and serves a critical function in the smooth function of the commission, it is important that the chair have broad understanding of the technology, legal, and regulatory considerations over which the NRC is responsible. Dr. Jaczko’s lack of such expertise led to a number of statements and incidents that required retractions by the NRC. Including, evacuation zone recommendations in Japan, as well as stating oversight concerns that go well beyond what the NRC legally can consider. In addition, there are regulatory and technical areas of overlapping agencies. The chairman should at least be familiar with how the EPA, local officials, and utility interact under emergency conditions. Equally important is an understanding of the division of responsibility between State Department, the DOE, and other agencies for proliferation and export control. This can be learned, but usually over a year or two as a commissioner. An obvious requirement for all commissioners, since they are each required to both directly manage their support staff as well as provide leadership to the broader industry. Commissioners have relatively small staff to manage. Some limited demonstration of managing and/or interpersonal skills is sufficient. Public speaking is a skill that, while not necessary to be an effective decision maker and regulator, is important in being effective in advocating for change and adequate oversight within the industry. Chair is leading an agency of 4000 people. It is important that the person in that position have demonstrated the ability to direct a large team with layers of reporting below. Examples would include: Department Chair or dean of engineering at a university, or a management position in DOE or a national lab would be appropriate. A demonstrated willingness to consider new approaches, technologies, and innovation to improve safety and performance is important for all commissioners. Commissioners should be open-minded in seeking to understand issues, reviewing innovative solutions and acknowledging that multiple approaches to problem solving are valid. Commissioners should be able to demonstrate effective team work. Including working within a team to develop consensus, accepting alternate approaches, the usual give and take of team membership. The chair of the NRC should be able to provide demonstrated ability to work in a “first among equals” team. Because the NRC’s unique 5 member commission makes all policy decisions as a group, the chair must be able to lead in this environment to develop consensus basis rulings and guidance to the staff performing the work. Similar working environments would be a leadership role in a team of peers that successfully completed its mission. Such evaluations should be supplemented by team member comments. Dr MacFarlane may well be a qualified NRC commissioner; she may even be qualified to chair the commission. What I ask for, however, is that such qualification be documented in past performance and demonstrated for the rest of us to see BEFORE she takes office as a commissioner. Even, more importantly, before President Obama (or anyone else) nominate her to the position of chair of the NRC. Events over the past year or more have made it quite clear the chaos and potentially disastrous consequences of a chairman who lacks understanding of the NRC’s role and an ability to lead such an important commission. Last night, I went to the NRC public meeting regarding licensing of a laser enrichment facility at the GE-Hitachi site north of Wilmington, NC. I’d never been to such a meeting before so I was curious to hear what was said and see who attended the meeting. The meeting was set up in a space at UNCW, the local university. That was the first fun thing, I don’t know all the buildings on campus, so just finding the building and a place to park was amusing. School is still in session at UNCW (finals week, I believe) so there were lots of students around. The NRC brought in a retired NRC staff person to act as a moderator, which I thought was very effective. It prevented any one individual or group from dominating the proceedings. The meeting started with introductions and presentations by the NRC staff. I learned a new acronym (we nuclear types really, really love acronyms) IROFS. Item Relied On For Safety. Apparently that’s the term for safety related items in nuclear fuel cycle facilities as opposed to nuclear power plants. Why in the world do we have to have different terms for the same concept? Is this just another way to confuse people? I thought the NRC did a nice job of going over at a high level all of the various areas they look at in granting a license to a facility. The presenter, Nick Baker, spend some time talking about risk management. In simple terms, if an event has a high consequence, it must be made highly unlikely, or even better “not credible”. Not credible means impossible in regular English. He also explained passive controls as essentially setting up the facility to make safe operation automatically happen without active intervention by people or equipment. There was some discussion about decommissioning funds. Unlike many industries, nuclear facilities licensed by the NRC must put together a plan for funding the eventual decommissioning of the site. This plan must include protections for the possibility of bankruptcy by the company that is applying to build the facility. The plan is reviewed every few years and updated. If the projections change, the company is required to increase the funding. Then the NRC reviewed the environmental impact statement in quite a lot of detail that I’m not going to try to repeat here. I was impressed with their thoroughness. Apparently, something of archaeological significance was found on the site, and they are actually shifting the roads to avoid damage to the location. The NRC expects to issue license September 2012. The folks at GE don’t plant to start construction until 2014. That seems like a long delay, but I presume there’s a business reason on GE’s part. Finally, they opened the floor for questions from the audience. It was very polite, with several citizens expressing support for the project as well as asking questions in more detail. Most folks with concern were worried about potential contamination with radiation of the environment. The NRC explained how the facility will contain material and sequester any dangerous compounds. One individual had come from South Carolina to raise concerns about proliferation. The NRC staff tried to explain the law regarding who has jurisdiction regarding proliferation concerns. It is a very complicated subject with 5 agencies having input to the matter. But in the end, the State Department has the final say. There were also questions regarding the depleted uranium. It will be stored on site as Uranium hexafluoride (UF6), in canisters. At ambient temperatures, the material is a solid and the canisters will be slightly below atmospheric pressure, so if a leak occurs (like a shot), the canister will pull air in, the chemistry within tends to be self-sealing and will likely reseal the leak. Eventually, these tailings will be delivered to the DOE, but GE will have to pay them to handle disposal. That payment is a part of the decommissioning fund. Since we live in hurricane territory, someone asked what would be impact of cat 4 hurricane? The NRC responded that the facility is designed to withstand it. In fact, it is built to same standard as nuclear power plants. Finally, apparently the state has recently identified a rare flower and a rare squirrel on the site. This was new information that had only been presented to the NRC on April 23. They are still looking into the impacts. With that the meeting ended. I was pleased by the polite interchange between the public and the NRC. Having heard of some terrible meetings where protests and abuse of presenters occurred, I was encouraged by the way the meeting was conducted and the behavior of everyone in the room. Finally back to blogging after a couple of weeks off. While my vacation was great fun, flying back to the east coast from Hawaii is a harsh trip and then catching up on everything took more time than I thought it might. However, this week I’m offering up something a little different for you, my readers. Last summer, I worked on an article for publication in the International Association of Energy Economists newsletter with a friend of mine, Rob Graber. That article was published this week in a newsletter dedicated to looking at how Fukushima affects the world’s energy supply. I’d like to invite you to read these articles and comment here. Last time we examined the industry demographics affecting development and growth of the industry. This week, we’re going to look at the social factors affecting acceptance of nuclear industry around the world. The nuclear movement has long had detractors that consistently find ways to try to eliminate the industry. Looking at the history of some of the major organizations and understanding the motivation can be instructive. FOE was founded in 1969 when David Brower split with the Sierra Club over nuclear power. Today, they claim environmentalism and human rights as their focus areas with a loose coalition of member organizations around the world. Campaigning against nuclear power continues to be one of their prime focusses. Creating a toxin free future with safer alternatives to hazardous chemicals in today’s products and manufacturing. This list of priorities is most interesting in that dealing with climate change is stated as a top goal, but ending the use of nuclear power is not. When one looks further into the Wikipedia article, much is said about stopping the use of coal or oil. The article states that Greenpeace considers the nuclear industry to be a minor industry with major problems. Greenpeace has, however, launched several anti-nuclear campaigns, including terrorist acts against nuclear power plants in Spain. This stance appears to be totally inconsistent. If climate change is a key concern, it would seem that using nuclear to lower carbon emissions and providing energy to countries desperate for more electricity (like India and China) would be far preferable to building more coal plants. Although the Sierra Club was initially not strictly anti-nuclear and actually supported the construction of Diablo Canyon. However, by the 1980’s the Sierra Club became firmly anti-nuclear. In fact, they oppose both nuclear fission and nuclear fusion. As an aside, when I was a new engineer in California in the early 1980’s, I tried to join the local chapter of the Sierra Club, thinking that the best way to change their opinion was from the inside by convincing the local chapter that nuclear power was in alignment with their goals. When I attended the first meeting and they found out what I did for a living, I was politely asked to leave the meeting and my check for membership dues was returned to me. Also founded originally to stop nuclear weapons testing, UCS nearly dissolved in the early 1970’s. It re-emerged as a “Nuclear Power watchdog” organization. While it claims NOT to be anti-nuclear, nothing in the records for UCS ever acknowledge positive aspects of nuclear power. When interviewed or quoted in the press, the UCS give a consistent, negative message to the public regarding nuclear power. It is interesting to note that two of the four started out opposed to nuclear weapons and drifted into opposition of nuclear power. At least in the case of the UCS, this move was mostly to save the organization from oblivion. Of these organization, three claim to be concerned about global warming and yet continue to oppose nuclear power. It is mostly these groups that form the loudest anti-nuclear voices. While the organizations are quite large, many of their activities are not in direct opposition to nuclear power (with the exception of the UCS). Thus their membership does not reflect a referendum on nuclear power. The NRC’s review process favors the interference of anti-nuclear groups. It does not take significant numbers of supporters, but only a few with relatively modest cost to develop arguments and submit contentions to the process. These contentions drive the cost up and increase the time required. The anti-nuclear organizations then claim that nuclear power is too expensive and takes too long. Pro-nuclear organizations operate at some disadvantage. Except for unique situations like the current VY court case, there are few venues to stage a rally. Since the NRC doesn’t really have a mechanism to file “anti-contentions” to annihilate contentions (like matter and anti-matter), there is no easy way for pro nuclear grass roots organizations to directly support nuclear power in their community. We who believe in nuclear power need to find ways to communicate about it and to publicize the positive aspects of nuclear power in responding to global warming, environmental effects of coal, and economic benefit to the community. I’m headed out on vacation for the next couple of weeks. You may or may not see a blog from me while I’m gone. I’ll be back for sure in October. The “S” in PESTEL is for Social. In a classic PESTEL analysis of the macro environment (in this case the Nuclear Industry) one looks at changes in social trends that can impact on the demand for products and the availability and willingness of individuals to work. In this first analysis, I’m going to look at the industry demographics affecting development and growth of the industry. Next time, I will be looking at the social factors affecting acceptance of nuclear industry around the world. The impending retirement of the baby boom generation has begun to have a significant impact on many industries in the US. This impact is magnified in the nuclear industry by two unique factors. Because nuclear was perceived as an undesirable career choice from 1980 to 2005, there is an entire generation largely missing from the ranks of the utilities, vendors, and regulators. In the last 5-8 years there has been a significant increase in interest in nuclear energy. Driven by climate change, peak oil and other fossil fuel concerns, this sharp increase has put intense pressure on the industry to hire more workers. These three factors have combined to create some very unusual demographic curves within the industry. 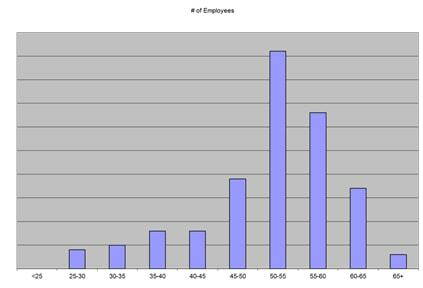 As late as the early 2000’s an analysis of the age demographics in the nuclear workforce showed what is called a J-skewed distribution. The figure demonstrates the age demographics for a typical nuclear company in the time frame. Working age is typically from about 22 until 65, with some folks delaying entry into the work force and some leaving before traditional retirement at 65. You can see in this curve that the peak number of workers was between 50-55 at the time this analysis was performed. The youngest quartile ranged in age up to more than 40 years old. These graphs were generally moving up one year for each elapsed year as the employee population continued to age. In fact, many company were driven to hire people as qualified as those who left in order to avoid extensive training time. Such practices continued to skew the curve upward. In “normal” industries one expects a more bell curve shape to the employee population with the peak somewhere near the mid range of employee ages. As nuclear tends to require at least a basic 4 year college degree, the average total career should be something around 40 years, with a median workforce age of 42, a few folks working beyond 65 and a few folks starting out a little less than 22. With the renewed interest in nuclear power starting in 2003, companies began much more intense hiring campaigns and began to hire younger staff. For many companies this began to lower the age distribution. However, the age demographics are still not normal with a large population under 30 and a large population 50 and over and few people in the middle, highly productive years of their career. This bi-modal distribution has a profound effect on the transfer of knowledge and leadership as well as the efficient restart of the industry. In some parts of the industry, significant formal training programs have been developed to bring these younger workers up to speed more quickly. In addition, efforts to hire mid-career employees from other industries with required technical skills and train them on the specifics of the nuclear industry has been helping to fill the gap. The nuclear industry tends toward a highly educated workforce. A significant fraction of the employees, especially at design firms, have advanced technical degrees. In order to provide such education, universities have to maintain vigorous nuclear engineering departments with access to test reactors and facilities. Many universities operate in partnerships with national labs or other government facilities in order to support such programs. However, in the operations staff, less formal education and more rigorous technical training is used. Many nuclear plant operators have come out of the navy programs in the US where they are trained to operate the smaller reactors used on navy ships. Training requirements can be fulfilled through formal education or through more industry oriented courses taught by organizations like INPO or companies that specialize in industrial training. For the developed countries that already have nuclear power well in hand, the demographics of the US are quite similar. Differences occur in countries with larger population growth and/or having maintained a growing nuclear industry. Japan, for example, has continued to build new plants on an ongoing basis and has encouraged new employment in the field throughout the past 30 years. There is less skewing of age in the workforce and more continuity in training and development. Countries trying to develop new nuclear programs have found the education levels required to manage a program entirely within country to be quite challenging. The NonProliferation Treaty limits the use of nuclear power for military purposes, further limiting access to some basic research and educational programs. Countries developing nuclear power must look to other non-weapons states to develop models for educating a work force for supporting a nuclear energy policy that is both efficient and safe. Last time we looked at the US economics of nuclear. The international view is more variable and worth a look at the same issues. It is interesting to note that most countries (with a few notable exceptions) have not changed their stance on building (or not building) new nuclear plants since the events in Japan. Economics seem to be a key driver in those decisions. Western Europe is much like the US in regards to economics at this time. Some countries are in more financial trouble than others, but stagnant economic growth and low interest rates dominate. However, there are some key differences that are driving different behaviors in different countries. The UK’s economy is much like the US, but with some key differences in the electricity and energy demand market. The UK was more strongly building wind turbines both onshore and off. With such efforts, the inefficiency of wind to meet energy needs has become more obvious. Solar was never really much of an option in the British Isles, and the decline in the North Sea oil and gas reserves as well as rising natural gas prices has given the country notice that other alternatives are needed. The UK also had to shut down much of its aging nuclear fleet. The technology used in many of the reactors has not been as robust as was initially believed. In shutting these reactors down, the need to develop significant suitable replace power became much more obvious to policy makers and thus made nuclear as more acceptable option. The French have maintained a nuclear program and have not indicated any rejection of nuclear. However with 75% of electricity already generated by nuclear, France has not indicated a plan to embark on any major building programs. As the current fleet ages, it is not yet clear how France intends to manage the impact. Some plant life extension, which is less expensive is clearly possible, but currently, there is little economic incentive for new build. Germany has been quite divided about nuclear power with the industrialized south generally more supportive of nuclear due to its low cost and generally high reliability. However, politics seem to have driven the country to drop the nuclear option. There is an economic factor that should not be ignored. Germany has considerable in country coal deposits as well as significant economic interests in Russian natural gas. Together with low growth rates, and some that are willing to try to make wind and solar work, these unlikely interests come together to eliminate nuclear from their current strategy. The Swiss had an initial knee-jerk reaction to follow in Germany’s footsteps, but at a much more measured pace. The Swiss have little outside resources beyond the hydro-electric system that they operate so well. Swizterland is a mature economy with limited growth and so has some time to make these decisions. Several eastern European nations have looked at Germany’s announced exit from nuclear power as a potential opportunity to provide energy in the shortfall. Poland and the Czech Republic both continue to be strongly supportive on nuclear programs. With the drop in production in Germany, the economic potential of new nuclear in both countries seems to tile more in favor of building new nuclear plants. Of course, there is a political aspect to any programs in these generally smaller countries within the EU. There is significant pressure from both Germany and Austria for these countries to give up their nuclear ambitions. In order for them to be able to fully leverage such opportunities, some support from pro-nuclear governments is needed. I include here China, India, the Middle-East, and other countries rapidly moving up the economic ladder. In all of these countries economic growth is enormous and in many there is significant shortage of energy. The choices to get large amounts of reliable power and still hold GHG emissions and cost within some reasonable limit are few. Thus, most of these countries have looked at what happened in Japan, concluded that modern designs are less prone to similar failures and are proceeding with new nuclear as quickly as they can safely do so. In many of these countries, alternative energy supply are also being pursued aggressively, but in the middle east, for example, the goal is to stop using oil for energy production so that it can be sold to other nations to continue economic growth at home. This is a quick summary analysis of extremely complex economic drivers in the international arena. However, it is clear that in general the drive to build new nuclear around the world is more clear in economies with considerable growth. Unfortunately, many of these countries do not have as clear a track record in safe operations of such complex facilities. Countries with well developed programs need to remain engaged in the construction and operation of nuclear power plants in order to remain in a position to influence developing countries despite the unclear economic drivers for nuclear power. Another week off of my planned strategic overview. The twin events of an earthquake near North Anna nuclear power plant in Virginia and Hurricane Irene sweeping up the coast has brought a lot of FUD (Fear Uncertainty and Doubt) articles about nuclear power. Because I live in Wilmington, NC and been through a number of hurricanes (including direct “in the eye” experience) AND I lived in San Jose, CA for the 1989 Loma Prieta earthquake, I feel that I might offer some perspective and potential clarity. Since the earthquake occurred first, let’s tackle this one. First, nuclear power plants are not designed to “Richter Scale” criteria. The Richter Scale is used to roughly measure the energy released in the earthquake. It doesn’t consider distance from the epicenter, how deep the earthquake was, or how the energy released might travel through the earth. What really matters at a nuclear facility (or any OTHER facility for that matter) is the actual ground motion at the facility. The direction and harmonic frequency of the waves and how they might cause equipment to shake, rattle, and roll also play a factor. However, the general public knows Richter Scale, so in an effort to be helpful nuclear plants have sometimes converted the criteria into a rough equivalent of the Richter Scale. This conversion, however, is cause for confusion and unnecessary FUD. The translation is usually meant to imply the earthquake was located on a fault directly below the facility. In reality being even a few hundred feet off that line makes a significant different in the amount of motion. So a 6.0 earthquake under the facility might provide one level of ground motion, but the same earthquake 100 yards away would be a lower ground motion at the facility. Picture a rock thrown into a still pond. The rings of ripples spread out from the rock as they get larger in diameter, they get smaller in size until they disappear. Earthquakes are much the same. What matters for a building or facility is that ground motion. Similarly, for hurricanes, the facilities are designed for a specific wind speed and expected storm surge (if they are on the coast). Facilities located even a few miles inland do not have potential storm surge issues, but are designed for possible flood scenarios. A category 3 hurricane (like Irene) headed toward North Carolina, does not mean that Brunswick Nuclear power plant will experience category 3 winds The category is designated by the maximum sustained winds measured in the storm, these winds are usually at or very near the center of the storm. In addition, the presence of land significantly slows the winds at ground level. So, once again, proximity to the storm and the coast matters. In the case of hurricanes, there is yet another significant bit of knowledge, with today’s radars, satellites, and radios, we know about hurricanes many days before they make landfall. This allows the utility to prepare in advance. The NRC requires these plants to shut down if hurricane force winds are expected within a few hours. The plants are well aware of the risk to offsite power and are careful to assure themselves that the EDGs will start-up when needed. A final word about natural disasters – I’ve seen many people ask questions about why nuclear power plants are not designed for “the ultimate natural disaster”. It is a good question. I like to explain it along these lines. All facilities, including nuclear power plants, oil refineries, and natural gas facilities, are designed to withstand events that are likely to take place during the facilities expected lifetime. The designers look at natural phenomena that occur in the region proposed for the facility, evaluate the likelihood of occurrence during the plant lifetime, the impact on the facility, the resulting impact on the surrounding population, and determine to the best of their ability the best cost vs. risk balance. In the nuclear industry, the NRC has to review and approve all of those decisions before the reactor can be built. In addition, unlike many facilities, these “design basis accidents” are re-examined when significant new information comes in. Plants are upgraded as required to assure continued safety. Arguing that the facility should be designed to withstand the “ultimate natural disaster” is like arguing that cars should be designed to assure no one will ever die in a car crash. There are vehicles that survive crashes at 200 mph and allow the driver to walk away, they cost millions of dollars and are usually driven on race courses. If we demanded that automobiles protected the passengers such that no one ever died in a car accident, these would be the only cars on the road and very few people would drive. In addition, how should one determine “the ultimate”? Is that a magnitude 10 earthquake directly under the facility? could a bigger quake happen? Same thing with hurricanes and floods. What is “the ultimate”? What is going to prevent something bigger? Should every facility plan for a direct hit from an asteriod as well? Determining how to draw the limit line isn’t easy, it requires turning human life into a number and weighing those numbers against each other. This calculus is done all the time from our court settlements, to insurance policies, to safety features on vehicles, to industrial facility design. Singling out a single technology and demanding that human life in regards to that technology is somehow more valuable is misguided and will result in more dangerous technologies and more deaths. In the past 12 months in the US, no nuclear power plant killed a single person. They all behaved exactly as designed, shutting down when hazardous events occurred and providing electricity to hundreds of thousands of people and industries. About 37,000 people died in car crashes. About the same died from the use of coal in the US. So where should we be placing our concern regarding risk? I went to the ANS UWC for the first time this past week. I had many excellent conversations and listened to many interesting speakers, so I’m taking a few days off from my strategic analysis series to provide a review of some of the goings on. There was an outstanding vendor technology Exhibit. The first night, we had the opportunity to walk around and see old friends as well as learn about new technologies being applied in the industry. As usual, I was amazed and impressed by all of the people and technologies being shown. Of course, there are always innumerable cool toys and souveniors to pick-up, although I restrained myself that first night. I think I counted 111 different vendors. The first day started out with a keynote speech from John Rowe, CEO of Exelon. Here’s a link to his prepared remarks. It wasn’t a pep talk, it was a reality discussion. It felt to me like the talk you get in the locker room when you are losing the game and you may not be able to pull it off. The reality of where you are today and what that really means. John didn’t always follow his script exactly and I fired off a number of tweets during his speech. Looking back at those, several struck me. Not what we in this industry want to hear. We keep complaining that we aren’t being judged on a level playing field with our competition or by our critics. It’s time to stop complaining and understand that reality. What do we do to either level the playing field ourselves, or to win the game on the unlevel field we’ve been dealt? I don’t have the answers, but maybe we should start thinking about this long and hard. Why is nuclear judged by a harsher standard? And how to we go about creating more consensus? I do not believe this will be done by staying in Washington and playing politics and policy games in the back rooms of Capitol Hill. While this is important, we as an industry also need to take our message out to the public, to engage directly with those people who are afraid or who do not know what to think. Their advocacy, or lack thereof, drives the local decisions to support, or oppose, nuclear power at the community level. By leaving these discussions to be started by groups with political and business agendas that oppose nuclear power, we allow ourselves to become defensive and to sound apologetic for our beliefs. We need to start the conversations and find common ground and ways to build consensus within those communities. Another pair of hard truths. John gave the industry a check on the first bullet – right reactor technology, and a big red x on the remaining 3. In his opinion, we lack a workable solution to the used fuel questions, slow growth limits the need for new generations and current natural gas prices and availability makes nuclear a poor economic choice. Many of us would argue about whether or not a workable solution to used fuel exists, but again, in the world of national policy, it does not today. The administration has stopped work on the one repository because of prolonged and strenuous objections from powerful interests in that region. More importantly, there are many who felt that decision was a bad one because it threw away potentially useful material. This issue needs to be resolved and cost-effective, politically workable solutions developed and implemented. It is not a technical problem, it is both an economic and a political one. On the last two points: Utilities are in the business of selling electrons, not fighting policy makers or making political statements. As long as natural gas costs are low, utilities aren’t real interested in a business busting 10-20 year bet on nuclear power. At least not in a merchant market like Exelon is in. Regulated markets like the SouthEast with high growth and poorer access to natural gas have a different economic equation. We see this same answer with other merchant generators: NRG and Constellation. The industry has a couple of choices, find a way to provide lower cost, shorter cycle solutions (perhaps SMRs). OR fight for a long term national policy that encourages and supports companies to make the big, long term investment in new nuclear plants. It is this long term policy that is allowing India, China, and other countries to continue to move nuclear energy forward. At last, a positive note from John. He’s right. And this part of our industry is undersold and underappreciated. We allow our critics to make too many unsubstantiated claims and we fail to point out the reality. My mother taught me not to brag about myself, but the industry needs to get over this reticence and speak out. Wow. Too many times we demand a public funding and argue for “public-private partnerships” and then complain when the private industry can’t sit in the driver seat. We need to find ways to support research and move forward without reliance on the government. We can demand that they allow us ways to do such work and the provide the avenues to be able to move new ideas into the commercial environment more quickly and efficiently. But until we are willing to pay our own way, we have to let the public half of the partnership steer the boat. John Rowe is a hard-eyed realist who has successfully led the largest nuclear utility in the US for many years. We have to thank him for his honest assessment and now buckle down and get to work and figure out how to change our future.